One of the things I don’t like about Excel 2008 is that setting zoom levels is a bit more complex than it need be. If you use Excel’s View -> Zoom menu, this opens a new window, from which you then need to select a radio button, or type in your custom zoom level. If you use the toolbar’s Zoom icon, you’re limited to a few settings without the ability to choose a custom zoom level. So here are two additional methods of zooming that I find simpler to use. If you’ve got a scroll wheel mouse—and really, if you don’t, you should get one as they’re great timesavers—you can zoom the active worksheet in Excel by holding Control and Command and then moving your scroll wheel up (increase zoom) or down (decrease zoom). The other solution is to add the Zoom In and Zoom Out commands to a menu in Excel, and then assign them a keyboard shortcut. The main downside to this method is that you’ll be limited to the same seven zoom levels that you see in the Zoom drop-down in the toolbar—25 percent, 50 percent, 75 percent, and so on. If these are the zoom levels you use most often, though, being able to access them with a simple keyboard shortcut is quite handy. Before you can assign a keyboard shortcut to the Zoom In and Zoom Out commands, you need to get them to appear on Excel’s menus somewhere. Select View -> Toolbars -> Customize Toolbars/Menus, and make sure that the new window that opens is on the Commands tab, with All Commands selected in the left-hand Categories column. Click once in the right-hand column, then press ‘Z.’ This should jump you directly to the Zoom In command, as seen in the image at right. Now look at the top of the screen, and you’ll see that there’s a smaller representation of Excel’s main menu bar, displayed immediately below the menu bar. 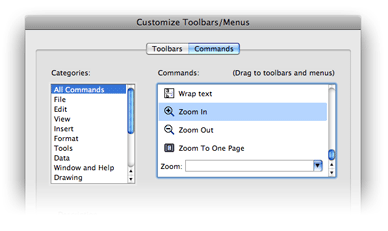 Drag the Zoom In item from the Commands section of the Customize window up onto the miniature toolbar; you can place it on any of the menus, in any position. I chose the View menu, as I thought that made the most sense, and placed it at the bottom of that menu, immediately below the existing Zoom entry. Repeat the process with the Zoom Out command; drag it onto the same menu you chose for Zoom Out, and (unless you prefer chaos and disorder) position it immediately below the Zoom In item you added earlier. When you’re done, you can click on the miniature View menu to see how things look; they should look somewhat like the image at right. When you have them set up as you like, click OK to dismiss the Customize dialog. The last step is to add keyboard shortcuts for these two new menu items. While you can do this using Excel’s built-in tools, I prefer to use the Keyboard Shortcuts tab of the Keyboard & Mouse System Preferences panel—at least on my machine, the shortcuts I assign in Excel don’t show up next to the menu items, whereas they do if assigned by the system. With the Keyboard Shortcuts tab open, click the plus sign at the bottom of the window, and then click on the Application drop-down menu. Scroll to the bottom and select Other, then find your copy of Excel 2008 in the new window that appears—unless you installed it in a non-standard location, it’s in the Applications -> Microsoft Office 2008 folder, and is named Microsoft Excel. Select it, then click Add to dismiss the dialog. In the Menu Title field, type Zoom In, then click into the Keyboard Shortcut field. When assigning a shortcut, you’ll want to use something that you’re reasonably certain isn’t in use by Excel, so using additional modifier keys is a good idea. I settled on Control-Option-period for Zoom In. Click Add to add the defined shortcut. Repeat this process to define a shortcut for the Zoom Out menu item—just remember to change the Menu Title box appropriately; I used Control-Option-comma for Zoom Out. If you’re running OS X 10.5, you can now Command-Tab back to Excel and look at the View menu to see your newly-defined keyboard shortcuts—test them out to make sure they work as expected. If you’re running 10.4, you’ll need to quit and relaunch 10.4 to see and use the new shortcuts. This method can obviously be extended to add keyboard shortcuts for any commands you regularly use that don’t currently exist on Excel’s menus.